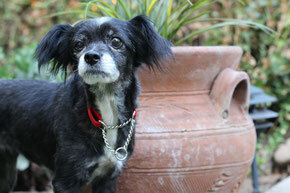 Molly is an 8 year old Pekinese/Papillon mix. She is currently 13 lbs and a little under weight. She came to the shelter as a stray dog. It was discovered she had a microchip. The shelter contacted her previous owner, but ufortunately they would not come pick her up as they did not want to her back. We felt sorry for Molly sitting and waiting for someone to come and rescue her.DOGzHAUS stepped up and rescued her from a local shelter before her time was up! She recently had a small eye growth removed and a few bad teeth, so she now has a clean bill of health.She gets along with cats, dogs, and children (with supervision of course). She walks well on a leash, and sleeps on a dog bed right next to her foster parents. She is a good eater which will help her gain weight. She also enjoys just hanging out with her foster human. She has attended many social functions all with superb behavior (restaurant patios, birthday parties, dog park, etc). Molly is a wonderful dog and is thankful to be in a warm home. She will greet you with love and wag her tail for you whenever she sees you. She is spayed, micro-chipped, UTD shots. If you are interested in meeting Molly Polly, please fill out our "Adoption Application"